Clark University’s Model United Nations Team performed well at the 60th session of the prestigious Harvard National Model U.N. Conference (HNMUN 2014), which took place Feb. 13 – 16 in Boston. The Harvard Model U.N. conference is one of the most competitive conferences in the Model U.N. circuit, attracting more than 3,000 student delegates from 75 countries. 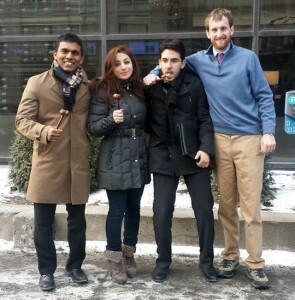 “Our team did an exceptional job this year, especially in the smaller crisis committees,” said Model U.N. Faculty Adviser Srini Sitaraman, Associate Professor of Political Science. 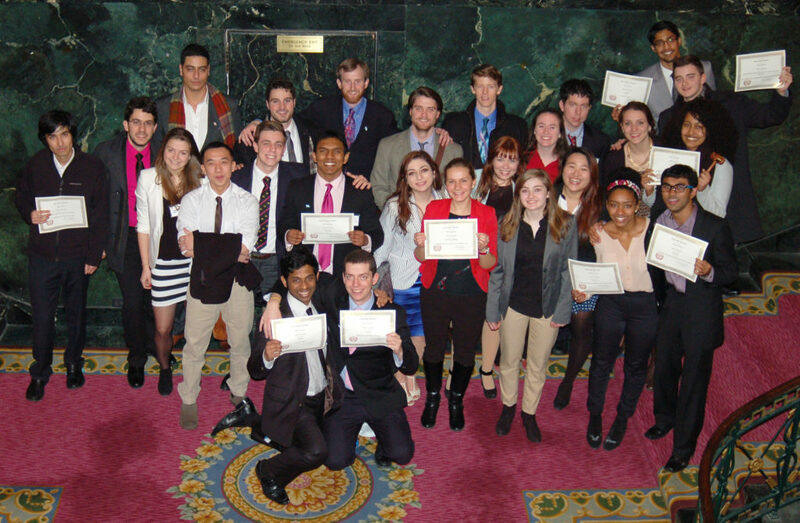 Clark University students won awards in highly competitive committees. Melat Seyoum ’15 and was awarded the Best Delegate for focused work in the Futuristic U.N. Commission for Science and Technology, Yohan Senarath ’14 and Shane D’ Lima ’14 were awarded Outstanding Delegate in the U.N. Security Council, and Dulara de Alwis ’14 won the Outstanding Delegate in the Special Summit on Sustainable Development. Several delegates received Honorable Mentions, including Vahid Sharifov ’15 in the Joint Cabinet Crisis: Berlin – East German Cabinet; Matt Isihara ’14, Tsar Alexander III Court; Sheila Qamirani ’15, Community of Latin American and Caribbean States; Themal Ellawala ’17 and Beliansh Assefa ’17, Commission on Crime Prevention and Criminal Justice; and Doga Bilgin ’16 and Patrick Bruchat ’15, Commission on Status of Women. Cori Welch ’17 received a Verbal Commendation in the Community of Latin American and Caribbean States. In January, a small delegation of Clark University students participated in a major international Model U.N. Conference at McGill University. Jake Kailey ’14 and Dulara de Alwis ’14 received the Outstanding Delegate award in the United Nations Special Session on Aging; Dea Dodi ’17 received the Outstanding Delegate award in the International Civil Aviation Organization Committee; and Doga Bilgin ’17 received a Book Award for his contribution to the committee on United States Council of Economic Advisors. The team will next head to the Brown University Crisis Simulation and it will also host the annual Middle School Model U.N. Conference on March 22 at Clark, with the cooperation of the U.N. Association of Greater Boston. The season will close at the Five Colleges Model U.N. Conference at Mount Holyoke College in April.